- - - Let us first look at the New Year. The new year begins with a lot of rituals and ceremonies and starts with three official holidays on January 1 till 3. Later the first work of the year is started, usually with some rituals only. He gives his greetings at the entrance (kado) and does not come into the house. They are most important and send to everyone. kadobiraki 門開き（かどびらき） "opening the gates again"
Many visitors, especially children, get a small gift of money in an envelope. For workers or sports clubs or other groups where people meet to eat and drink. Most began on January 11. This was done by the merchants on January 11. They would make the first entry in the account books (choobo 帳簿) and then celebrate with their workers and pray for a busy new year. February 8. Work stopped on December 8.
. Carrying luggage in the Edo period . Misaie, Mi Sai E 御斎会, on an auspicious day. 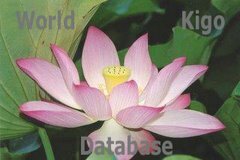 The duties at Ise shrine were also started on this day.
. WKD : Matsurigoto 政 . The importance of a matsuri, a festival for the appeasement of the deities, can also be seen in the word matsurigoto, a word that originated in the performance of religious festivals by the emperor or regent and soon became identical with "governing" in general. shigoto hajime 仕事始 (しごとはじめ) "first work"
Here are a few things done for the first time in the New Year, around the home, the garden, the farm, the mountain forest and other places where people work during the year. Most remind us of the harsh life of the farmers of old. The carpenters' tools were very important, and many of these first rituals were performed in a temple or shrine, to pray for the safety of the wood workers, carpenters and carvers during the coming year. choona was a very special bend ax for the carpenters to process large beams. first use of the carpenter's ax . This is done in a ritual way as an offering for the Deity of the fields (ta no kami), usually on January 11. In Northern Japan, manure is transported to the fields in a sledge. First carving of the woodcarvers, making Buddhist stautes, masks for Noh or decorations for the palaces, temples and shrines. Before starting the work, the master of the workshop will put some offerings to the deities. honaga 穂長（ほなが）"long ears of rice"
This ritual has various names in different parts of Japan. 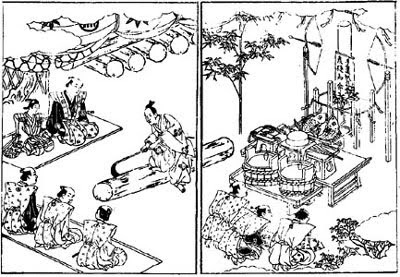 Before cutting the first tree, mochi and sake was offered to the Deity of the Forest and the woodcutters prayed for safe working conditions. Sometimes the mochi offerings were taken back home and preserved until spring for the first field work, as a prayer for good harvest, hence the name "long ears of rice". wakayamabumi 若山踏（わかやまぶみ）stepping on the "young mountain"
futsukayama 二日山（ふつかやま）"mountain on the second day"
Ritually entering a mountain forest to make offerings to the deities. Mostly on January 11. Farmers wifes used to dye their own threads and fabrics at home. Potters decorate the kiln with shimenawa decorations, make offerings of salt and sake and pray for the security of the workplace. A ritual of the potters. kuwa can refer to the hoe held by hand or to the plough. Hacke; Feldhacke; Haue; Spaten; Pflug. Farm work was the most important and during the New Years days the movements of various activities were made in the front garden whilst praying for a good harvest, mostly on the 11th day of January. Sometimes grains and salt or even mochi were carried to the fields and offerend to deities. 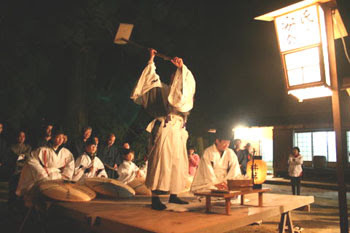 Some rituals were also performed in the Shinto shrines. nawa iwai 縄祝（なわいわい）"celebrating the ropes"
Only straw ropes for the farmers' New Year ceremonies are twisted. In some areas on the fourth of January, in others this is done on the third. nodenai, node nai are thin ropes to bundle the rice. This was done on the second of January. Weaving was common in many areas in winter at home or in a special room.
. orimono 織物　weaving － somemono 染物 dyeing . On the second of January, new mochi are pounded, sometimes only the gestures are made, and put as offerings for the deities on the Shinto Shelf (kamidana). Now some work-related kigo for other seasons. harugoto 春ごと ( はるごと) "spring things"
In Kanto on February 2, or on March 18 or 21. In Kansai on a day in March or April. In other regions on a day when it rained in spring. People would take a day off from work, enjoy a walk in the fields, take a boat trip, prepare mochi ricecakes or other festival food and have a drink of sake. natsugare 夏枯 (なつがれ) "withering away in summer"
The second and eigth month of the lunar calendar were the slowest for business, just after the new year and after the ancestor O-Bon festival. Especially in summer many people went home, or were away in summer holidays and few visitors came to the shops in the big cities. Many stores and offices stopped work on this day and attended to ceremonies for the end of the year. Work began again on January 8.
yoigani, a kind of Shanghai crab preserved in alcohol.
. . . CLICK here for crab Photos ! Here, Issa mentions a "heart" (mune) at a size of 3 sun (1 sun = approximately 1.2 inches, therefore 3 sun = around 3.6 inches). Shinji Ogawa notes that sanzun no mune ("three-inch heart") isn't an anatomical heart, but rather the heart of mental activities; in this case, the English word, "mental" of "mental arithmetic." He paraphrases Issa: "Since there are not so many things, my inventory is done mentally." 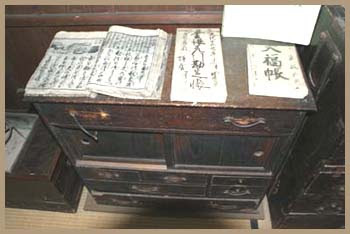 Yosa Buson 与謝蕪村 in Edo . It would be hard to imagine another haiku poet of Japanese tradition depicting this scene of three neighbors relieving themselves on New Year's Day, standing in a row. The earthy humor and, deeper down, feeling of human connection make it recognizably the work of Issa. This spring hokku is from the first month (February) of 1811, when Issa was staying in the city of Edo at the house of the haikai poet Natsume Seibi. On the far side of the big Sumida River, whose near bank was just east of Seibi's house, was a village consisting mostly of irrigated farmland called Koume, Little Plum Tree. It is the season when people go out to see and hear bush warblers (uguisu) sing early in the new year, especially in plum trees, in which the birds often perched. The image of bush warblers singing in plum trees can be found in many waka and renku as well as in ink paintings, and it was regarded as auspicious to hear the birds in what was regarded as their most natural perching place. What Issa sees is a little different. The farmers in Little Plum Tree have gotten out their hoes and other farm implements and have begun to prepare their fields for the new planting season, and when Issa hears a warbler singing its sweet song -- which in Japanese is heard as hou-hokekyo, hou-hokekyo, something like "Lo, Lotus Sutra, Lo, Lotus Sutra" -- he discovers the bird is perched on the handle of a hoe, one perhaps leaning against a farmhouse or a shed. He is evidently moved by the way the warbler has taken to the humble hoe, even though the hoe can't compare at all with the beauty of a blossoming plum branch. Is the warbler attracted by the smooth surface of the handle, which has been rubbed so many times by a farmer's hands? In any case, Issa seems fascinated by the thought that the name of the village suggests that here even a farm implement can be treated by a warbler as if it were a little plum tree in bloom. This momentary fusion of natural trees and a human-made object may suggest to Issa an unconsciously achieved harmony between humans and their environment. This link is to a woodbock print by Hiroshige made only a few years after Issa's hokku that shows some farmhouses and rice paddies in the village of Little Plum Tree. The freshwater canal, used for drinking water and irrigation, empties into the nearby Sumida River. This hokku is from late in the sixth month (late July) of 1821, when Issa was in his hometown. It is the hottest time of the year, but this humble smith who makes and repairs farm implements is working overtime to repair and sharpen people's hoes, sickles, and other tools in preparation for the harvest season ahead. In autumn he will be inside at his forge making new implements, but now he seems to be making the rounds of the local farmers and taking care of their dull, nicked, or bent tools and implements, and in the hokku he seems to be working just outside of one farmhouse -- perhaps Issa's house. Issa seems impressed because he knows how tired and hot the smith must actually be, and yet the man works smoothly, never complains, and shows consideration for others by never interrupting the relaxed mood of the farmers enjoying the comparatively cool night air nearby. He no doubt fans himself sometimes, but his motions are probably graceful, and to others it looks as if he is enjoying his work almost as much as they are enjoying sitting outside in the evening. Issa seems to have a lot of respect for the smith's work ethic and endurance.